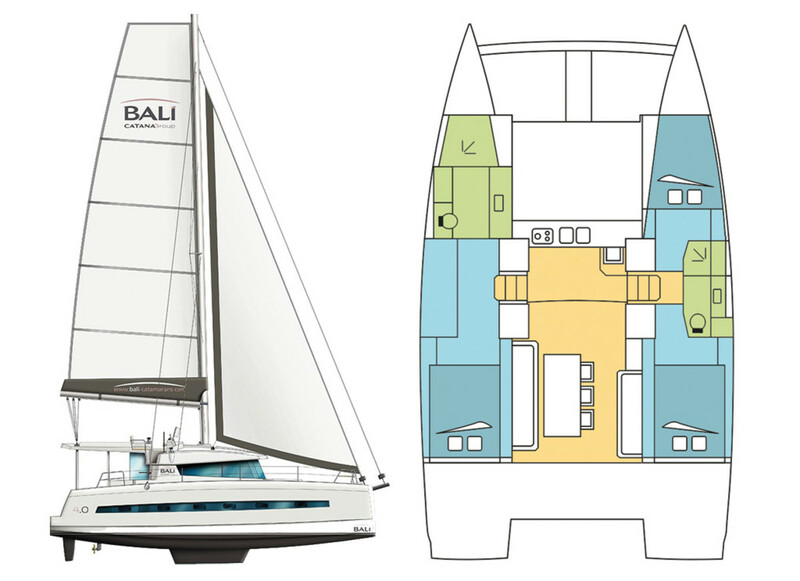 Bali Catamarans is creating quite a lot of buzz in the sailing community with its unique layouts and chameleon convertibility. But there is more to the new Bali 4.0 than just novelty. It’s also a real sailboat. Bali’s parent company, Catana, builds the Bali 4.0 of vacuum-bagged, foam-cored sandwich in La Rochelle, France. This is a strong, lightweight way to mold a hull, and since there is no wood in the laminate, it will not rot. 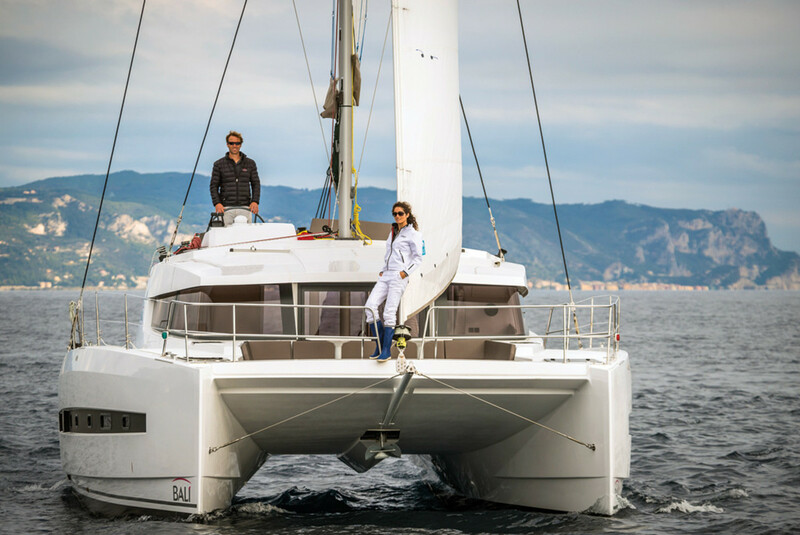 The solid foredeck also serves as a structural member and is built of box sections and kept light in weight. The nacelle below the foredeck should deflect waves and reduce slamming. The interior joinery is Alpi, an Italian composite material made of thin African woods laminated together with an attractive outer surface. On our test boat, this was all tabbed into the main structure and the cabinetry fit perfectly. Complementary fabrics complete a calm, modern, tasteful décor. The plumbing and wiring were neat and properly installed, with through-hulls of the alloy common to European boats along with double-clamped hoses and well-organized wiring. The entire boat meets CE standards for Class A, Ocean for 10 people. I really like the side decks of this cat. They are wide, with good nonskid surfaces, and a handrail is molded into the cabintop. 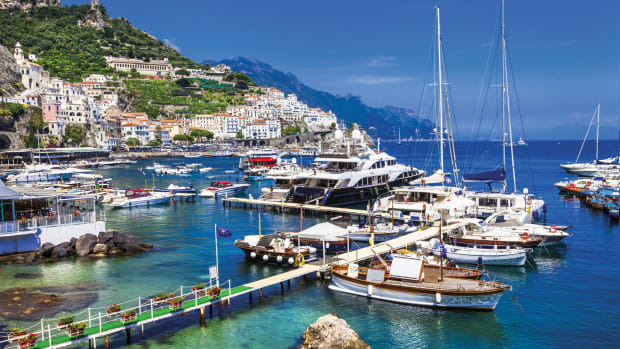 However, things get dicey when you move up to the forward lounge area, where there are no grab points forward of the cabin, the steps to the table are narrow, and moving across the foredeck can be uncertain when the boat encounters waves. The rig is simple and powerful, with a VMG aluminum mast. 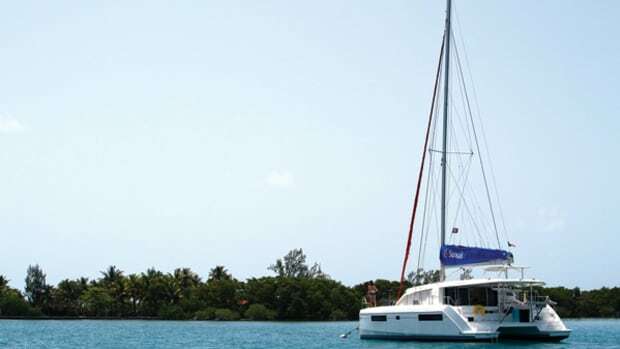 A self-tacking Solent jib on a traveler makes coming about simple, and a big, square-topped mainsail delivers plenty of drive. Although all lines lead nicely to the raised helm station and are easy to reach, I recommend electric winches for both the halyards and sheets on the Bali boats. Hardware is by Antal, with the headsail furler coming from Profurl. The Bali 4.0 has about the best dinghy davit system I’ve seen, with the entire afterdeck transom lowering from husky steel supports to produce a platform for boarding. When raised, the dink is well above the water. The eyecatcher of Bali boats is always the cabin “Garage Door,” which opens on hydraulic lifts to create a huge living space. In inclement weather or when the mosquitoes come out, just lower the door and retreat to the interior. The builder no longer uses an electric mechanism for the door, a simplification I welcome. Up a few steps to starboard is the raised helm. It’s not really a flybridge, but it is high enough for excellent visibility, with everything in sight except the stern of the port hull. The helmsman isn’t completely isolated, either, thanks to the big lounge pads that adjoin the helm station where guests can recline and chat. Navigation electronics are Raymarine. 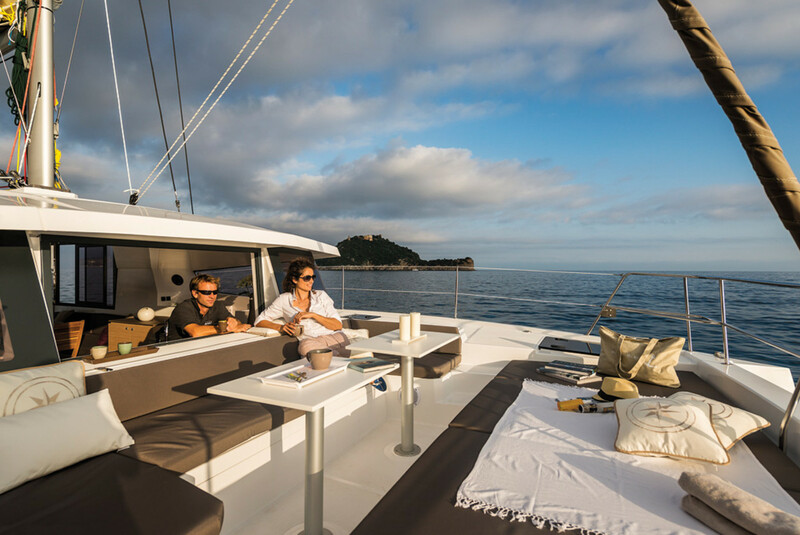 The accommodation layout of the Bali 4.0 is stellar for a coastal cruising couple who take occasional friends along, or for a flock of daysailing guests. You also won’t find a better layout for entertaining in a marina or at anchor. 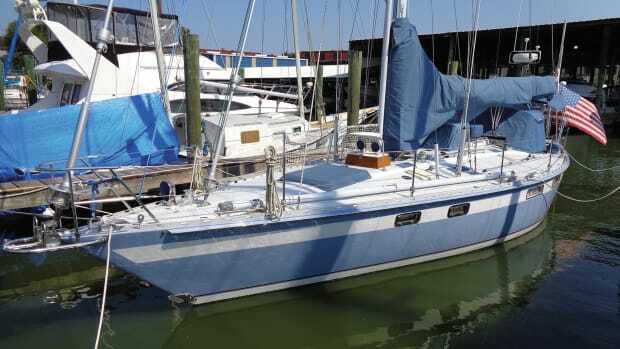 The entire port hull of the version I sailed is an owner’s suite, with a big double berth aft and a large head compartment forward, complete with separate shower. There is a lot of stowage space, including a usable bilge area for cans, bottles and other heavy items that won’t be bothered by humidity. The galley includes an Eno stove and Liebherr fridge. The starboard hull is divided into two cabins, each with space for a couple, with a shared head compartment between them. Bali also makes a version with two ensuite heads in this hull, plus a model which has four cabins, presumably for charter businesses. The saloon, perhaps more properly called the lounge, is a huge space similar to a nice apartment ashore, with a large linear galley forward, an upright household fridge and seating for a multitude around the table. However, it does lack overhead grab rails for rough water, a serious oversight. The center of the windshield drops down like the window of a school bus for wide-open access to the foredeck. I found it difficult to operate, but a taller person (I am 5ft 8in) might have no problem. Raise the “Garage Door” between the saloon and the afterdeck, and you have a vast area for a party, with the breeze blowing straight through. 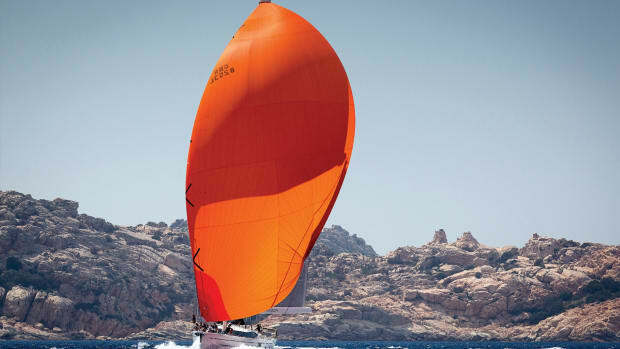 The Bali 4.0 is a surprise under sail. It may look high and stubby in profile, and the layout looks more like a house than a sailing vessel, but this boat goes. 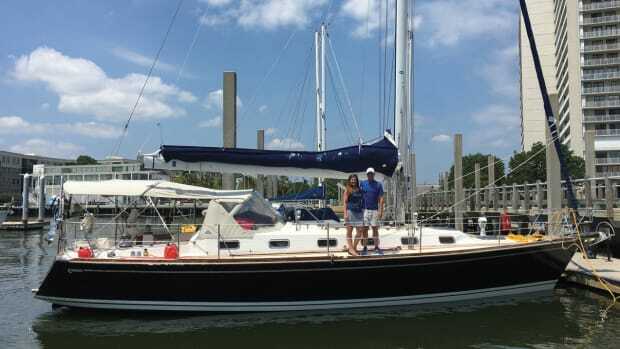 In 8 to 10 knots of breeze on a fine Chesapeake summer day, I measured about 6 knots of boatspeed on a close reach. Bearing away to a beam reach, that picked up to nearly 8 knots in the occasional puffs. 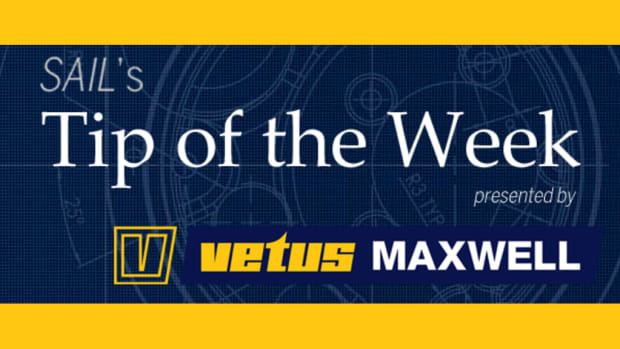 The boat performs to windward, too, tacking without effort through 80 degrees, while the self-tacking Solent jib made the maneuvers simple. 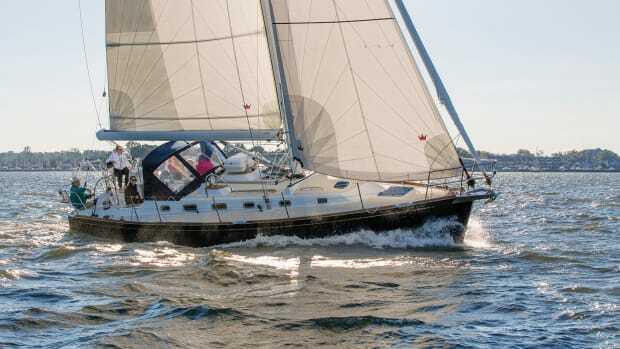 Understandably, the big square-top mainsail creates plenty of weather helm by itself, so you will need to always have a headsail up, reefing the two sails together as the wind increases. That main is heavy, too, and the boom is too high to reach without a step stool. Although there was little wave action on our test sail, the Bali 4.0 went through the motorboat wakes we encountered with little fuss. The bridgedeck clearance seems adequate. An unexpected pleasure was the light, responsive helm coupled with excellent tracking. As with most cats, there’s not as much steering feedback as from a monohull, but pointing the boat was simple and quick. The Bali 4.0 is probably the most nimble midsize cruising cat I have handled under power. The rudders are well aft in the prop wash, so they exert plenty of leverage. The turning circle was less than one boatlength with both engines running forward, and of course, doing the “cat pirouette” with the props turning in opposite directions lets the boat spin within its own water. If you want to just go forward, run the engines up to 2,300 rpm and watch the hulls slice through the water at 8 knots. Sound levels inside and out are quite low, producing a relaxing ride under power. The Bali 4.0 fills a niche that sailors may not have known existed.  It’s an apartment afloat, a party platform and a coastal cruiser. And yes, it’s a good sailboat, too.